The Apple iPad Mini 4 puts uncompromising performance and potential in your hand. This tablet is light and thin, making using it on a daily basis convenient. A 7.9inch Retina Display capacitive touchscreen adorns this tablet, rendering crisp and clear content at screen resolution of 2048 x 1536 pixels. This touchscreen, which has an oleophobic coating, that makes it easy to interact with and easy to wipe off prints. This hand held computer incorporates an Apple A8 chipset with a 64bit Dual Core processor, clocked at 1.5GHz, executing applications smoothly. Capture memorable moments in utmost clarity by making use of the 8MP primary camera. The iPad has built in WiFi and 3G connectivity that enables convenient Internet connectivity. The Apple iPad has an internal storage capacity of 16GB, letting you store lots of data, multimedia, applications, games and ebooks. The silver finish of this hand held computer makes it looks delightful. Dimensions of 8 x 5.3 x .24inches and weight of .67lbs make using this computing device easy to use. The Apple iPad mini 4 is a marvelous choice for those seeking seamless data and media consumption. This hand held computer incorporates an A8 chipset with a second generation 64bit Dual Core processor clocked at 1.5GHz that lets you run resource intensive applications with ease. Integration of sensors like the Touch ID sensor, Three axis gyro, Accelerometer, Barometer, and Ambient light sensor let this hand held computer respond to external stimuli in novel ways. 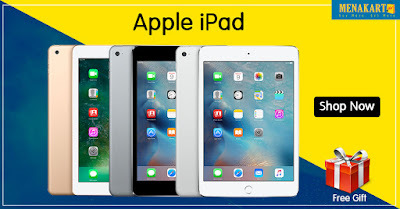 The Apple iPad mini 4 runs on the iOS 9 operating system that offers a user friendly interface. This operating system provides easy access to all the applications on the device. This hand held computer implements new features like Slide Over, Split View, and Picture in Picture that facilitate seamless multitasking. The Apple iPad Mini 4 incorporates a unique and effective technology called Touch ID to regulate access. Conveniently unlock your tablet computer by means of your finger which has a unique print. You can also authenticate purchases made on iTunes, iBooks, and the App Store. The Apple iPad Mini 4 features an iSight camera that lets you click great pictures easily. This iSight camera is a result of firm focus on design, performance, clarity, as well as ease of use, incorporating advanced optics, a highly capable Apple designed image sensor, and an improved 8MP lens. You can capture a variety of amusing images by making user of the iSight camera that implements Panorama mode, Burst mode, Tap to focus, Photo geotagging, and Timer mode. The FaceTime HD camera has a refined sensor and large pixels that give you wonderful performance in a variety of lighting conditions.